Short Review: Stylish Boston-based brand Flow Kimonos have joined the growing number of companies offering a hemp gi. The appropriately named 'Flow Hemp' has a relatively beefy 550gsm jacket and 11oz (376gsm) trousers, both 100% hemp. Flow do not overdo their designs, stripping it back even further here: there are no big patches, just a few splashes of subtle embroidery in a pleasing green, black and white colour scheme. As with their Pro Series 2.0, Flow Kimonos cater to a broader range of body types than some gi companies, with L (Long) and H (Heavy) on offer in addition to the standard A sizes. The main negative is the price, an unavoidable problem with hemp, though in comparison to the rest of the hemp market the Flow Hemp is among the most affordable. Available to buy here for $199. 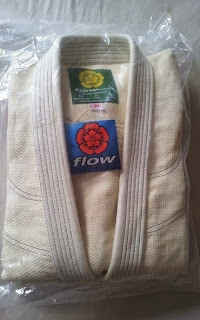 Full Review: When I last reviewed a gi from Flow Kimonos (the Pro Series 2.0), I was excited by the news of another prospective hemp gi on the market. 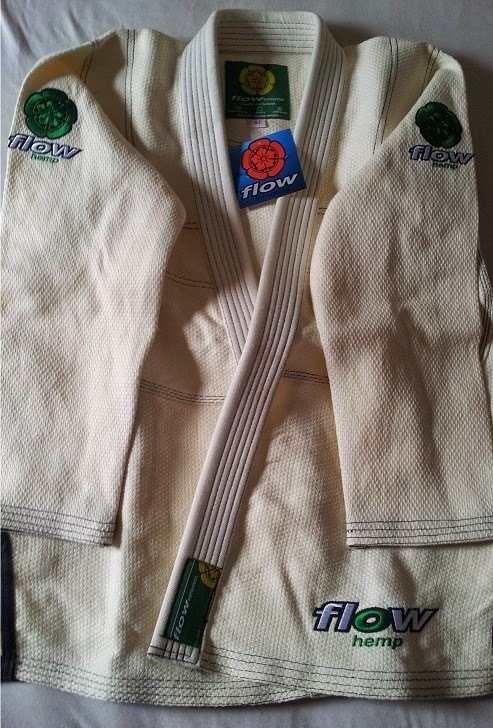 That gi has since arrived, the simply named Flow Hemp. The hemp gi market into which it has entered is growing gradually, with multiple choices now available in what was once a very narrow field. The first ever hemp gi was probably from Ground Force around 2005, judging by old threads like this, with a 2006 review of the gi here. That 2006 review thread included a certain Chris Odell looking to buy a Ground Force gi in March 2007: he would go on to found Datsusara that same year. Odell's company is now arguably the market leader in hemp equipment for BJJ and MMA, justifiably able to take the credit for popularising hemp within BJJ, or at least proving the viability of creating BJJ equipment with hemp. After beginning in 2007, Datsusara released their first gi in 2008, the HCG-01. I reviewed the HCG-02 here, then most recently their third release, the HCG-03. Odell is currently up to the HCG-05. The Green Gi (referring to their ethical stance, not the colour of their gi) have been around almost as long as Datsusra, when founder Adrienne Adams hand made her own prototype gi and promptly won a blue belt middleweight gold at the Mundials in it: I'm wearing that same gi in the picture. After a long build up, Adams recently released her first gi from The Green Gi, dubbed the Blue Dream (sold out at present). I have a factory reject Blue Dream jacket, picked up when I visited Adams a few months ago. Although it isn't the finished article - and I therefore won't be reviewing it, as that wouldn't be fair - it does provide a useful point of comparison. I'll talk a lot more about The Green Gi when I review their hemp belt: I've been testing that for around a year now. Along with The Green Gi and Datsusara, the hemp gi market includes Lucky Gi, then finally there is the gi I'm reviewing today from Flow Kimonos. Surprisingly, both Flow and Lucky worked closely with Odell, despite the fact they are all technically competitors. That kind of community amongst business rivals is rare, though I don't know the exact details of the relationship between them. One issue where all these companies appear to agree is that they must not let fake hemp in the gi market go unchallenged. Chris Odell eventually released this video, as according to lab tests he had paid for, Submission FC were selling a 'hemp blend' that the reports seemed to show did not in fact contain any hemp whatsoever. Each company is positioning itself slightly differently, though they all tend to comment on environmental issues (The Green Gi is probably the front-runner in that category). Lucky Gi, an old stalwart of the industry led by veteran grappler Scotty Nelson, have decided to follow the clunky 'squeeze page' online marketing of the '90s to sell its 'Hempire' model. That's a strategy popularised in BJJ circles by the distasteful antics of Lloyd Irvin, in stark contrast to the subtler approach adopted by other hemp gi companies. Lucky is also charging a massive $420 for its hemp offering, almost twice as much as any of its competitors. Then again, I haven't tried the Hempire, so perhaps it manages to live up to that hefty whack of cash. The Green Gi comes in at $239 (although I think that includes shipping: the $200 pre-order price did) and Datsusara at $230. The Flow Kimonos 'Flow Hemp' comes in next at $199, with shipping at around $13 to the US and $55 to the UK. That fits with Flow Kimonos' old mission statement of sustainability, slightly updated on the current version, as there is now no mention of organic cotton (understandable, as the commitment to hemp demonstrates it better). A perhaps more significant change in the wording between the two versions is in the 'community service' section. At the time I reviewed the Pro Series, it read "We pride ourselves on contributing to as many projects as possible. We’re an American company based in Boston, MA and we love that the Brazilian Jiu Jitsu community is so strong. If you’re out there doing good for others, we want to help you FLOW. Seriously, if you know of a great cause hit us up and we’ll see what we can do to help." As I said in the review, I liked the emphasis on building the BJJ community through projects, with the implication that charitable efforts and doing good would be an important goal for Flow. The current version of the statement reads quite differently. It appears to indicate a shift to athlete sponsorship rather than the charitable work that the old mission seemed to point towards: "We pride ourselves on supporting athletes and contributing to the BJJ community. We love that the Brazilian Jiu Jitsu community is so strong and want to do our part in growing the community." When an individual or organization is trying to make a difference in their community I try to pitch in however I can. The business is still in startup stages, which necessitates that I run a tight ship, so I'm pretty selective about who I help out and to what extent. Getting on to the actual gi, at this point, I've had the opportunity to train in four hemp gis. 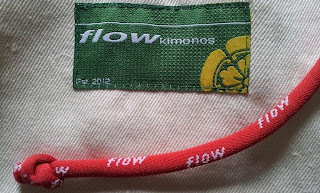 That includes two from Datsusara (the HCG-02 and the HCG-03), the 'Flow Hemp' from Flow Kimonos and a factory reject jacket from The Green Gi's 'Blue Dream'. Given the level of collaboration between Datsusara and Flow, you would expect some similarities between their gis. 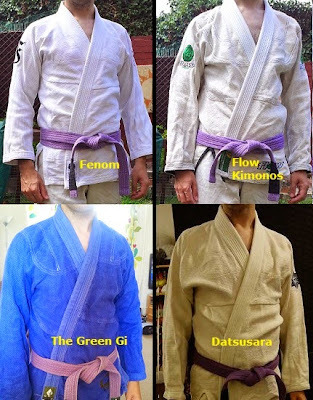 They both use a basket weave, whereas The Green Gi has gone for more of a pearl weave (if you don't know what I'm talking about, there is a primer on a few different weaves over on the Fenom Kimonos blog). The Flow Hemp has not had any of the lint-shedding issues I've had with both of the Datsusara gis, possibly something solved in more recent editions of the Datsusara. I've been using the Flow Hemp regularly for a month, washing it five times over that period (three times at 40 degrees celsius, twice at 30) and drying it in the sun. Pre-washing, the trousers were 93cm long, shrinking to 89cm after their trips to the washing machine. The jacket started off with a wingspan of 158cm and 75cm shoulder to hem: that's dropped to 153cm on the wingspan, but stayed the same shoulder to hem. In terms of weight, my A1 Flow Hemp jacket comes in at 800g, the same as my A1 The Green Gi jacket. When you add in the trousers, the Flow Hemp weight goes up to 1.6kg. Compare that to my HCG-03 (also A1), which is 1.1kg with just the jacket, increasing to 1.8kg with the trousers. The Flow Hemp jacket is 550gsm, while the trousers are 11oz (376gsm) hemp twill. Comparing the collars of my hemp gis, The Green Gi and Flow look similar, though the covering material has some differences in texture. On the Flow, you can see those diagonal lines I'm used to from cotton twill trousers, whereas the Datsusara has an entirely different bobbled pattern. The cut of the Flow Hemp jacket is much tighter than the HCG-03, though there is still some give in the chest. In terms of hemp gis, the best fitting jacket I've got is from The Green Gi. Having said that, I do have narrow shoulders for a guy: as you can see from the comparative picture, the A2 Fenom jacket - which is cut for a woman - fits me quite well (for reference, I'm 5'7 and around 145lbs). As with any hemp, the white is a 'natural white', as bleach would damage it: if like me you dry the gi in the sun, that will lighten it somewhat, but not much. Having said that, I can't personally see a huge difference between the white of the Flow Hemp and the white of the cotton Fenom Lotus. The HCG-03 picture was taken indoors last year, but the Fenom and Flow Hemp pictures were taken in my garden, minutes after each other. The hemp gi is designed to be heavier and take the abuse of daily training while remaining super soft and comfortable. My intention was not produce a light competition hemp gi although the gi is tournament legal. Since it costs a good chunk of change, I want customers to feel the quality the second they lay hands on it. The additional panel of fabric on the Datsusara trousers goes from just above the knee right down to the bottom of the trousers, whereas the Flow finishes midway down the shin. That's just enough to cover the knee when you're sitting on your heels (e.g., when you're on top in closed guard). It would therefore benefit from a little more length, but it does the job. On the plus side, that makes the trousers slightly lighter: this is another area where the Datsusara has some extra weight. The Flow is bulkier when it comes to belt loops though, boasting six of them grouped in pairs. The HCG-03 only has two, right at the front. 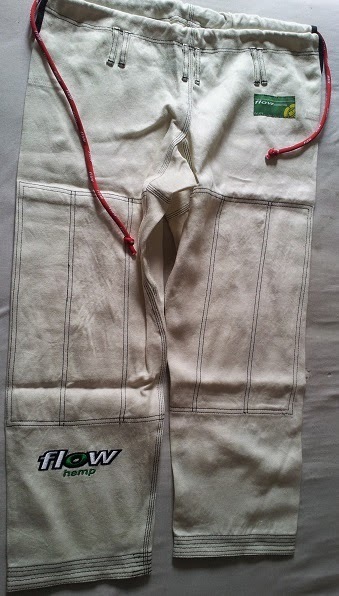 The Flow Hemp gi design is similar to the Pro Series 2.0, with embroidered text in the same places. I am not a fan of text on a gi, but it is less obtrusive this time round. 'Flow Hemp', embroidered in black, green and white on the bottom of the jacket and the right trouser leg, is only eight letters (further minimised by varying the size of the two words: 'hemp' is in a much smaller font underneath 'flow'). 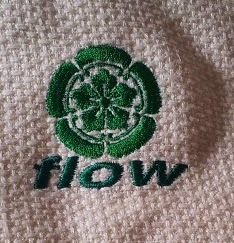 The Pro Series 2.0 embroidery had an excessive twenty characters, due to spelling out 'Flow Kimonos Pro Series' in full. There's another small logo in green on the back of the left trouser leg, along with the upper back of the jacket. Either way, the Flow Hemp is certainly flashier than the Datsusara. In addition to that green, black and white, plus red on the drawstring and some yellow on the patches, there is dark grey too (or is it black? 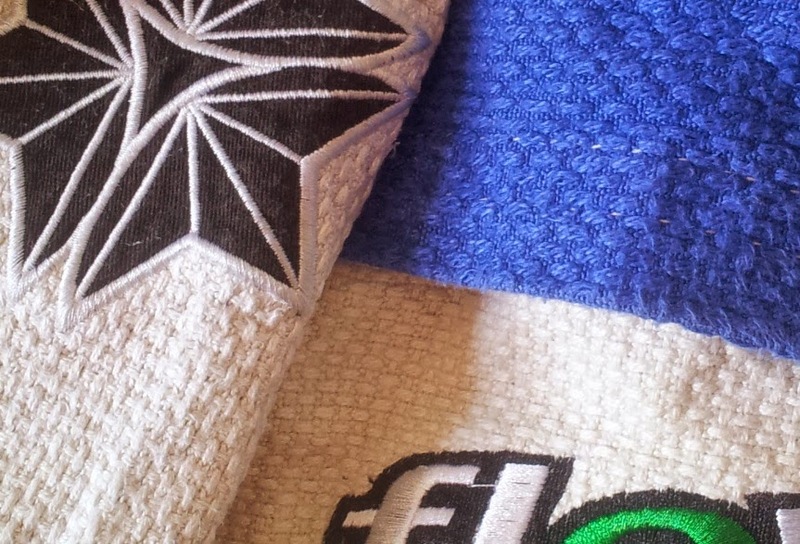 I'm not always great a distinguishing finer differences between shades) contrast stitching. The same colour is used for taping on the side vents, sleeve and trouser cuffs. 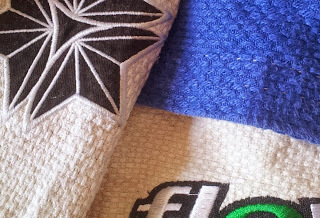 Much to my pleasure, the patches on the leg from the Pro Series 2.0 have not been carried over: in fact, the Flow Hemp ornamentation is almost all embroidery. The only patches are those typical to most gis, at the bottom of the collar and the top of the trousers. On balance, the Flow Kimonos 'Flow Hemp' is the best hemp gi I have tried to date (although I should note that I haven't had a chance to try a finished gi product from The Green Gi yet, just that factory reject jacket, plus I haven't experienced the Lucky Gi Hempire). It's comfortable, stylish and durable. The drawstring has the advantages of not getting tangled as can sometimes happen with flat versions, as well as avoiding the irritating length of so many bungee cords. The Flow Hemp isn't excessively blingy, but it's got enough touches of colour to appeal to those with more flamboyant gi tastes. It is also currently the best value hemp gi on the market, available to buy here for $199.99. In general terms, that's still an expensive gi, but put against its competitors (especially the ridiculous $420 price tag for the Hempire), it's affordable, particularly if claims about hemp's durability are well-founded. How does this compare to a bamboo gi like the bamboo frenzy? Unfortunately, I've not yet had a chance to try a bamboo gi (if there's a company that wants to send me one, I'd be happy to take a look ;D). If you haven't read it already, Georgette's review of her bamboo gi is well worth a read, especially as she also discussed the manufacturing process (which is interesting, as that is the part that really lets down the 'green' credentials of bamboo gis).